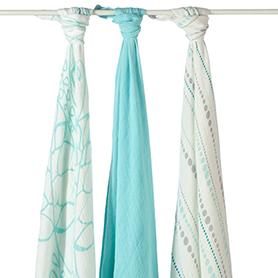 Our bamboo swaddling blankets are a super soft addition to your nursery. Made of rayon from bamboo fiber muslin, these luxuriously soft aden + anais® blankets are the ideal fabric to use on baby's delicate skin. Can be used as a stroller or nursing cover, changing pad cover, tummy time blanket & more!